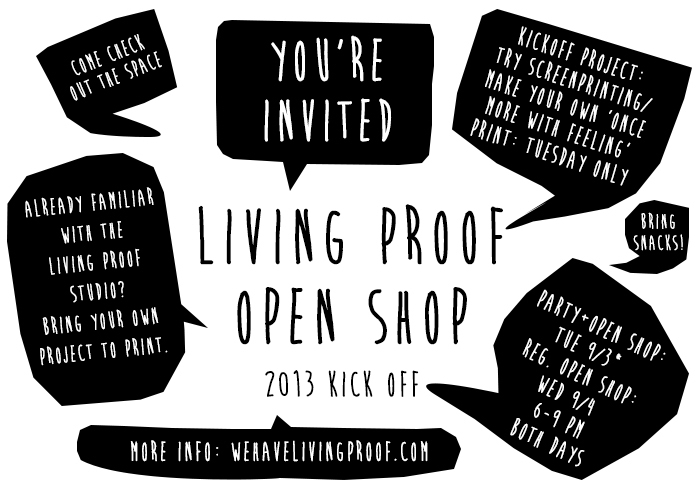 We’re having a kick off party this Tuesday to celebrate the return of Living Proof’s Open Shops. Join us on Tuesday Sept 3 for a Kick Off party from 6-9 PM. Come hang out in our space with us, join us for snacks (it’s a potluck), print a “Once More With Feeling” print (designed by Andrew Gramm of Living Proof based on our latest catch phrase), or bring your own project to print if you have printing experience already.